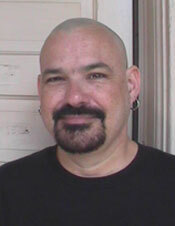 John Parrish graduated from the Department of Religious Studies in 2004. He went on to pursue graduate study in Christian Origins at the University of Alberta, the University of Toronto, and Brown University, while maintaining his interests in 19th & 20th C religious thought. In the following, John reflects on the role played in his own undergraduate education by the late Dr. Tim Murphy, pictured above as he looked when he arrived in the Department in the Fall of 2002.